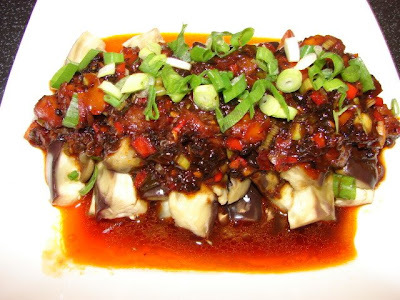 If you like fish fragrant aubergine you will like this recipe. I have made this several times. No meat at all and it's quite yummy. Semi peel the aubergine (like tiger stripes) then cut into long thick strips. Steam for about 20 minutes or till very soft. While the aubergine is steaming prepare the sauce. Rinse and roughly chop the black beans. Chop the garlic, chilli and spring onion. Cut the tomatoes into small cubes. In a frying pan or wok heat the oil then add garlic, stir fry at medium heat for about a minute then add black beans and stir till fragrant. Then add the chilli bean sauce follow by sugar, wine, vinegar and a little soy sauce to taste. Reduce the sauce to quite thick. Then add in the tomato, quick stir then leave it alone, the tomato will give out quite a lot of liquid. Heat high to reduce the liquid. When the liquid has reduced to about half or less, add chilli and 3/4 the spring onion. Stir. Sauce is ready. When the aubergine is cooked, take it out of the steamer and pile the strips neatly on a plate. Remove any liquid. Spoon on the sauce. Then sprinkle with the remaining spring onion. I had this with rice or plain noodles.